The Dancing Exhibition on the Capitol Lawn is a traditional event at the Nation's Capital Feis every year! The 24th Annual Nation's Capital Feis and All-American Irish Dancing Championships was held July 24, 2011, at the Sheraton National Hotel in Arlington, Virginia. An Exhibition on the Capitol Lawn took place on July 23rd. This much-loved summer Irish dancing competition was hosted by Laureen O'Neill-James, TCRG, ADCRG and member of the Irish Cultural Hall of Fame. 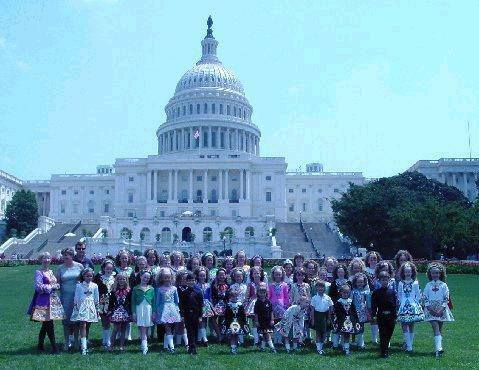 O'Neill-James runs the O'Neill-James School of Irish Dancing which draws Irish dance students from the Capitol area with its main studio located in Virginia. This year's Nation's Capital Feis paid tribute to Irish American presidents of the United States. Renowned adjudicators arrived from as far as Ireland and as close as metropolitan New York: Kevin Broesler, Sean Flynn, Donny Golden, Kerry Kelly Oster, Patricia Early McLoughlin, Carmel O'Rourke Tighe, Aine and Seamus O'Shea, Eilis Rochez-McKenna and Noreen Smith. Favorite feis musicians kept the busy stages moving, starting with the youngest dancers. This year, all of the competitions that have traditionally taken place over two days were compacted into just one day. Little dancers experiencing their very first feis brought smiles to start everyone's day, with 1st place in the reel for those under 6 years-old going to Jane Ferry from O'Neill-James, 2nd to Morgan Holden from Broesler, 3rd to Anne Taylor from Sheeaun (CT) and 4th to Thomas Green from McGrath. First place in the light jig for those under 6 years-old went to Kyra Sexton from Hunt, with 2nd to Morgan Holden, 3rd to Jane Ferry and 4th to Isabelle Fontana from O'Neill-James. One of the more interesting competitions at Nation's Capital Feis is the combined music/dance event, with each competitor judged on both their dancing ability and the music they have played and recorded. First place went to Kayley Kiesel from Teelin, 2nd to Claire O'Halloran from Scoil Rince Ni Dubhthaigh, 3rd to Cecilia Garvey from Boyle and 4th to Lauren Kate Hurlocker from Muggivan. Preliminary Championships were won by Peter Mildrew (u9), Katherine Kivimaki (u10), James O'Reilly (u12), Emma Davis (u14) - all from Boyle, Erin Miller from O'Grady-Quinlan (u11), Matthew Larson from Culkin (u13), Kylie Kalnan from Breffni (u15), Kaley Smith from Broesler (u16), Grady McDavit from O'Neill-James (u17) and Kaitlyn Cawley from Murphy Irish Arts (17&over). Open Championships were won by Kasey Methven (u11), Owen Luebbers (u13), Katie Roszyk (u14) and Tory Zehnder (u18) - all from Broesler, Haylee Kirk from McDade-Cara (u12), Katherine O'Connor from Burke-Conroy (u15), Sean McCann from O'Neill-James (u16), Brigid C. Rosendale from O'Grady-Quinlan (u17) and Laura Payne from An Cor Rud (18&over). Adult Open competitions were won by Babs Husson from O'Neill-James (Reel), Lynne Joyce Haslbeck from Culkin (Light Jig, Slip Jig, Hornpipe), Cheryl Day from McGrath (Single Jig), Molly Coe from Niall O'Leary (Treble Jig and Traditional Set) and Wei Leong from Niall O'Leary (Treble Reel). Further results may be viewed at FeisWorx. Subscribe to Feis America, North America's favorite Irish dancing magazine, today to get Irish dancing news delivered to your mailbox every other month! The September/October issue features 12 pages of North American National Irish Dancing Championship photos and stories!